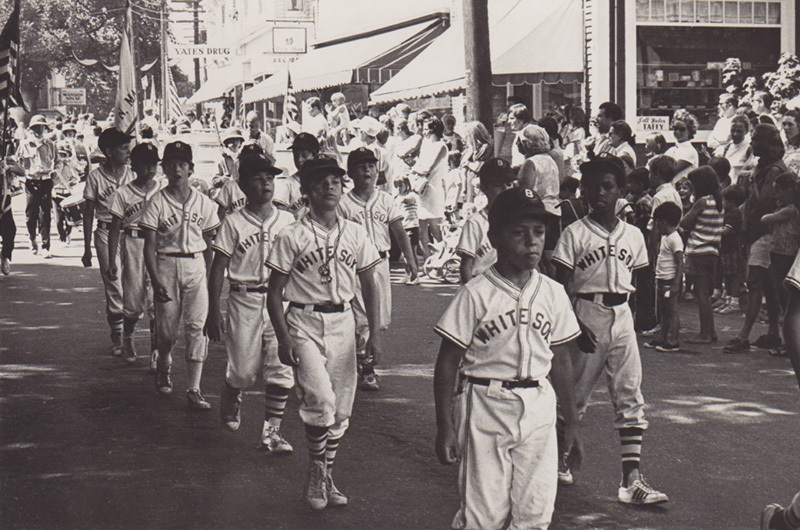 White Sox on the march in late 1960s Edgartown parade. Edgartown’s Fourth of July ceremonies began on the morning of the third, when the submarine Becuna arrived in the outer harbor and was welcomed by a gun from the Yacht Club and in turn fired a salute of its own. First the sub was boarded by a welcoming committee, then the Yacht Club was boarded for a drink. Commodore James A. Farrell Jr. was amused to note that the officers from the Becuna were more interested in finding their wives, who were supposed to be meeting them, than they were in having a drink. Wednesday night wasn’t the best weather but it facilitated boat and plane landings so that all the husbands, commuters and weekenders could reach the Island, and transportation was operated at peak performance. The Bodes played for dancing on the town dock that night and Edgartown filled up. In no time Dock street became a sea of milling faces. The Navy arrived in the form of some enlisted men from the submarine and clashed with some civilians in the neighborhood. Patrolman Robert S. Bruguiere blew his whistle and any rumpus that might have been forthcoming subsided. The Fourth was not the kind of day usually depicted on calendars. The flags were flying and the bunting was hung, but the day was not hot and sunny. It could in fact be considered excessively damp, for it started with a downpour in the pre-people hours and then drizzled until noon. Hordes found the beaches clammy and arrived in Edgartown to visit the submarine. Filling the streets with an ambling parade. Pedestrians peered in the closed shop windows, noses glued to the glass like children, they wobbled the street on bicycles, and many incessantly ate ice cream cones. After noon people form all directions seemed to end up on Dock street. The Edgartown Yacht Club, the flagship Impala, Cruzian, Pretty Marie, Exact and many other craft in the crowded harbor dressed ship in honor of Independence Day, but the flags hung limp, heavy with water in the heavy air. In the early afternoon a car broke down on Main street. Extrication was a difficult and lengthy process and traffic blocked the street. No one honked, no one much minded. There was stirring in the harbor as spectator fleet, racing craft, and patrol boats went out for an afternoon’s racing. But wind was light, and there was more drifting than racing. In the evening the town people began to fill up more rapidly as people came early to be on hand for the parade, to get parking places, or good sites from which to watch the fireworks. The parade was the best yet and lacking the usual filler of road department trucks. The Auxiliary Coast Guard float was gay and colorful and complete to a sidewheeler with rotating paddle wheels and the good old name of Uncatena. The float called Future Island Workmen had so many industrious workers aboard that it shed wood chips along the route, and at the end of the parade there were great gouges in its wooden supports. The Cerebral Palsy Camp’s red flowered bus was in the parade as well as bikes, convertibles carrying officials, and other floats, contraptions and wheeled vehicles. And the martial music and bright flags were rousing to the spirit. Between the parade and the fireworks, whistles of policemen were busy chirping, and pre-firework banks reminded all of things to come. It was not until long after the last cannonade from the harbor had stopped echoing over the white houses and the boat horns had stopped blowing their applause that at last the old shire town of Edgartown emptied out with trails of red tail lights and returned to a semblance of its former self. The harbor was ablaze with lights from the boats which occasionally changed position or charged about. It was rimmed with sparklers, roman candles and lighted boathouses. Not a breath stirred, and the inky waters became a mirror to the spectacle of color which blazed above. Low on the surface mother and baby ducks zigged with each echoing bang, dodging bits and fragments of unburnt rockets. Horn, whistles and bells rang with approval as the harbor was lighted bright as day, time and time again. Once with suddenness the Chappy point spread out with light and the pattern of a peacock’s tail as a rocket exploded on the ground. Since the show went on, it appeared that no one was hurt. After a final outburst of snap, crackle and sparkling pop, a deafening bang escorted a final star heavenward and left it to float slowly down alone. Instead of the usual land-bound American flag, the National Anthem played by the Coast Guard band echoed and re-echoed form house to house and from shore to shore. When it was all over, the Harbor Light, once more restored to its rightful place of importance, winked red in a black sky and reflected red on the crystal sea.